iii) Measure magnetic fields at high spatial resolution. V -- The electrostatic potential, or called the mean inner potential (MIP in V). Therefore, the phase of an electron is very sensitive to changes of dopant-induced potential in the specimens. In order to optimize the acquisition of holograms, in many cases, the microscopes need to be re-configured. For instance, Cooper et al. turned off the probe corrector in their FEG FEI Titan microscope even though it had been installed. Both the objective lens and third condenser lens were turned off, and a Lorentz lens was used in order to extend the holographic field of view to 1500 x 700 nm2. Consequently, the fringe spacing in the holograms was 3.5 nm, resulting in a spatial resolution of ~10 nm in the reconstructed phase images. i) The p-n junctions in the phase images do not extend all the way to the specimen surface, especially for low dopant concentrations. 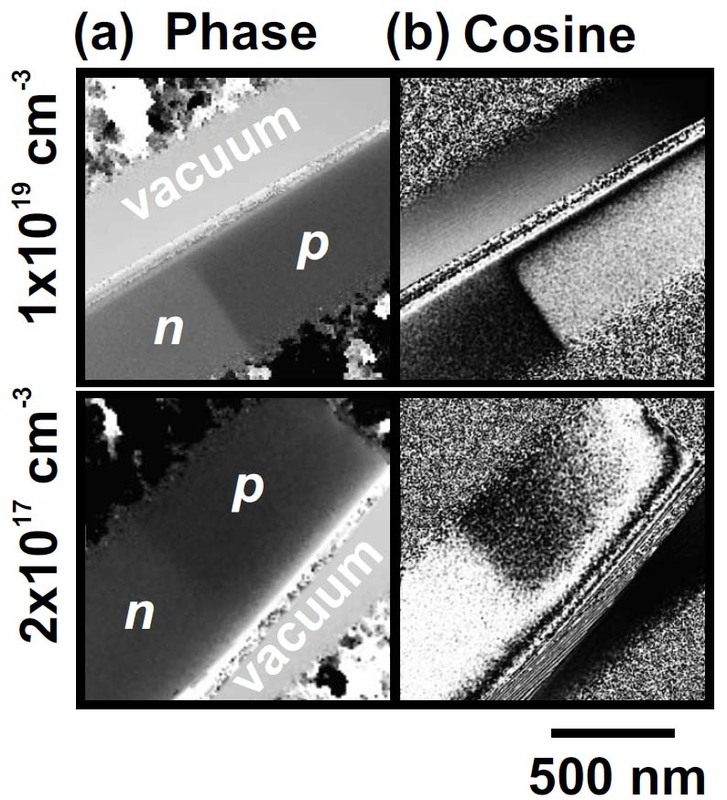 ii) The near-surface of p-doped region appears to be at the same negative potential as the n-doped layers in the junctions, due to surface charge. Note that for a FIB-prepared specimen, there is an electrically inactive layer on both surfaces so that t needs to be replaced by t-tinactive. Here tinactive is the total thickness of the inactive layers on both sides of the TEM specimen. W. D. Rau, P. Schwander, F. H. Baumann, W. Hoppner, and A. Ourmazd, Phys. Rev. Lett. 82, 2614 (1999). David Cooper, Pierrette Rivallin, Jean-Michel Hartmann, Amal Chabli, and Rafal E. Dunin-Borkowski, Extending the detection limit of dopants for focused ion beam prepared semiconductor specimens examined by off-axis electron holography, Journal of Applied Physics, 106, 064506 (2009).